Earlier this year, I published my first coloring book, Floral Designs. Here is a brief overview of my process. I began by making a list of subjects that interest me (science fiction, steampunk, fantasy, human anatomy, architecture, quotes, patterns, geometric designs, flowers, ocean life, wild life, pets, holidays, and celebrations). Next, I searched on Amazon to find out what were the top sellers, and what kind of comments users had given to those coloring books. I ended up spending more time than I had budgeted for on this step. It was hard to pick a subject, but eventually I based my decision on the number of reviews the books on a particular subject matter got on Amazon. Probably not the best way to make a decision, but my very basic non-scientific research gave me a starting point. I decided to make a coloring book on the subject of flowers. I experimented with two different styles – true likeness versus graphic representation. I chose graphic representation because I knew I could do that faster than the other one. Based on this style, I chose to title my book “Floral Designs” instead of “Flower Designs”. Since I wanted to publish via Create Space, I checked what sizes were available and picked one of the standard sizes (8.5 by 11 inches). Most of the coloring books, on an average, have anywhere between 30 to 80 illustrations (some have even more than 100). I decided to create a coloring book with 50 illustrations. This decision was based on three things. First was the price point on which I would be able to competitively price my book on Amazon. Second, the amount of time I had planned to devote on this book. Third, I wanted to create my illustrations so that I could repurpose them later and license the colored versions as art collections. I started by building a library of floral elements. 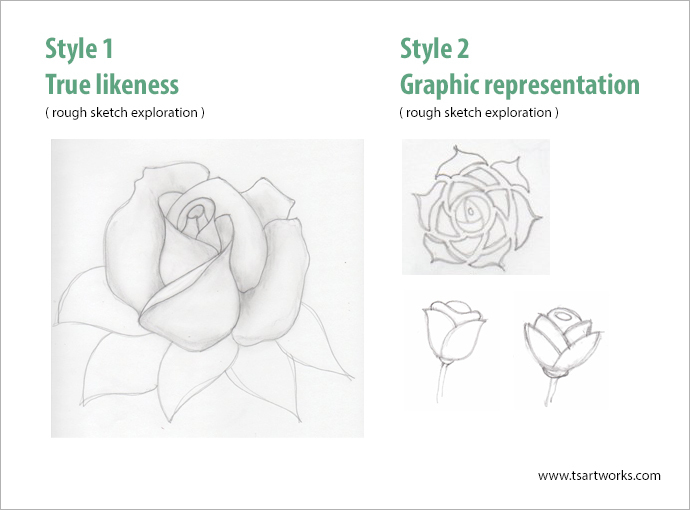 Some elements were first sketched on paper and some were created directly in Adobe Illustrator. Since my goal was to license my coloring book illustrations as art collections also, I divided the 50 floral designs into 5 art collections. Each collection consisted of 8 illustrations and 2 seamless patterns. Based on this direction, I started creating my art in Adobe Illustrator. For the color versions of my art, I kept things pretty simple – only flat vector art. No use of textures or Photoshop. Each colored illustration was created in a bigger size (18 by 24 inches / 300 dpi). I will cover this topic in a separate blog post.